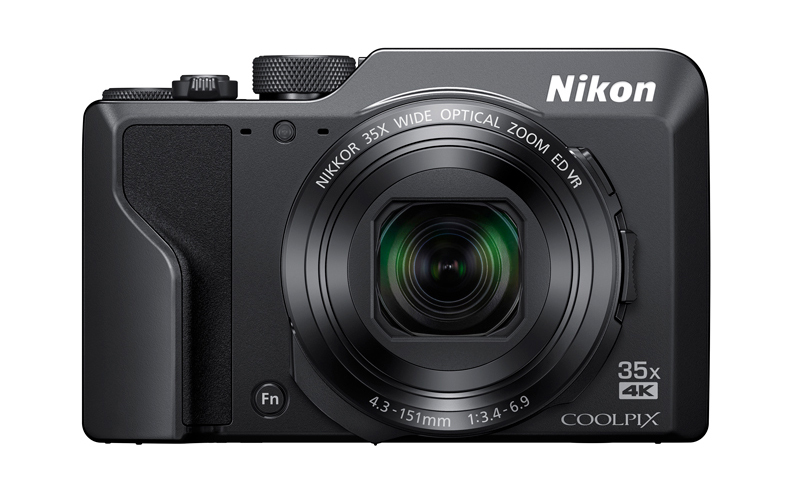 Nikon Corporation (Nikon) is pleased to announce the release of the COOLPIX A1000, a stylish compact digital camera equipped with an electronic viewfinder that supports 35x optical zoom. The COOLPIX A1000 boasts a compact size for ease of portability, and comes equipped with a 35x optical zoom lens that covers a range of equivalent focal lengths — from the wide-angle 24 mm*1 to the super-telephoto 840 mm*1 (Dynamic Fine Zoom further expands the zoom ratio to 70x*2). This allows users to easily enjoy super-telephoto photography that delivers images with sharp and clear resolution. The COOLPIX A1000 supports a maximum sensitivity of ISO 6400. The camera is also equipped with a lens-shift vibration reduction (VR) function for still-image shooting, and hybrid vibration reduction (VR) for movie recording that is effective even when recording 4K UHD movies. The camera's Active D-Lighting function reduces the loss of details in highlights and shadows in high-contrast situations such as backlit scenes. The function can be applied to both still images and movies. Additionally, photos can be captured in RAW (NRW) format, which allows users to process and edit images according to their own artistic preferences and intent without compromising image quality. *2At the maximum image size. The maximum zoom ratio varies by image size. Dynamic Fine Zoom refers to the area in which the camera can zoom while maintaining resolution from the maximum zoom position, and is the combined ratio of optical zoom from the maximum wide-angle position and digital zoom. *3iPhone®, iPad®, iPod touch®, and Android™ devices to which the SnapBridge app has been installed can be used. The SnapBridge app can be downloaded free of charge from the App Store® and Google Play™. See Nikon's website for further information. The stylish COOLPIX A1000 is equipped with a high-performance 35x optical zoom NIKKOR lens that covers the wide-angle 24 mm to super-telephoto 840 mm range of focal lengths (equivalent focal lengths in 35mm  format). With Dynamic Fine Zoom, sharpness is preserved throughout the digital zoom range, which can be expanded up to 70x*, or a focal length equivalent to approximately 1680 mm (in 35mm  format), ensuring sharp and clear rendering even with super-telephoto shooting. Additionally, the A1000 is equipped with a macro close-up mode that allows users to enjoy macro photography when shooting as close as 1 cm (0.4 in.) to the lens at the maximum wide-angle position. The COOLPIX A1000 has an effective pixel count of 16.0 megapixels. Its backside illumination CMOS sensor is capable of collecting sufficient light, even in dimly lit or dark surroundings, to capture a wide variety of scenes with superior image quality. It supports a higher maximum sensitivity, with a range of standard sensitivities of ISO 100-6400. The camera is also equipped with a lens-shift vibration reduction (VR) function. This ensures that images are sharp and clear, even in dark or dimly lit scenes. Further, support for RAW (NRW) recording has been added, allowing users of the COOLPIX A1000 to use Capture NX-D, Nikon's RAW processing software, to create beautiful photographic works without compromising image quality. The COOLPIX A1000 captures the finest details with its ability to record high-resolution 4K UHD (3840 x 2160 pixels) movies. The camera's hybrid vibration reduction (VR) system, which combines lens-shift VR with electronic VR, can also be used with 4K UHD recording, enabling smoother and clearer hand-held and telephoto zoom recording. In addition, the Active D-Lighting function, which effectively reduces the loss of details in highlights and shadows in scenes exhibiting great contrast, such as those that are backlit, can also be applied during movie recording*. The COOLPIX A1000 is equipped with an approximately 1166k-dot equivalent electronic viewfinder. The electronic viewfinder has an eye sensor that automatically switches the display between viewfinder and camera monitor as the camera is lowered or raised to the eye. Not only does viewfinder shooting achieve a steadier shooting stance that helps reduce camera shake - by making only the recordable angle of view visible - it also allows the user to concentrate on the intended subject, aiding the process of composing shots. A constant connection between the camera and a smart device is possible using the SnapBridge app, built-in Wi-Fi®, and Bluetooth® technology. Not only can images captured with the camera be transferred to a smart device automatically*1, they can also be automatically uploaded to Nikon's photo sharing service, NIKON IMAGE SPACE*2. The SnapBridge app supports a number of other features as well, including the ability to add copyright information and comments to images, and to automatically synchronize camera date/time and location information with that of the smart device. SnapBridge also makes remote shooting of still images possible with real-time display of the view through the camera's lens on the smart device screen. *1Images (JPEG) reduced to 2-megapixel equivalent can be transferred automatically. Automatic transfer of original JPEG images and movies is not supported. Transfer of RAW (NRW) images is not supported. *2There is no limit on the number or size (volume) of JPEG thumbnail images (2 megapixels) that can be automatically uploaded from the SnapBridge app. Storage for original JPEG images is limited to 20 GB. A Nikon ID must be registered to take advantage of this feature. · The Bluetooth® word mark and logos are registered trademarks owned by Bluetooth SIG, Inc. and any use of such marks by Nikon Corporation is under license. · Wi-Fi® and the Wi-Fi logo are trademarks or registered trademarks of the Wi-Fi Alliance®. · Apple®, App Store®, the Apple logos, iPhone®, iPad®, and iPod touch® are trademarks of Apple Inc. registered in the U.S. and/or other countries. · Android™ and Google Play™ are trademarks of Google Inc.
· Other trademarks and trade names are those of their respective owners.